Important you "MUST" leave 4 second gaps between overs. This is to give all the other links time to reset. The link has had a hum on TX for a few weeks now and at long last I have found the problem. It turned out to be a small PSU that powers the D-Star interface. This has now been replaced. Today I have installed a new radio on the link, its a Motorola GM300. This will free up the Yaesu 7800 that was in use on the link for the new GB6CL 70cms D Star node as soon as I get the NOV. 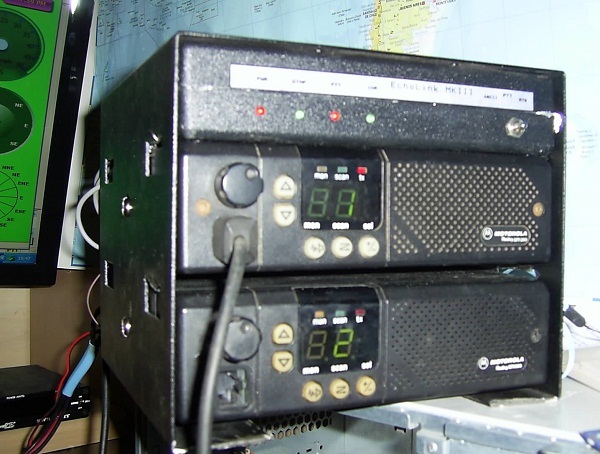 The top radio is a Motorola GM300 VHF with the Echolink interface on top. The bottom GM300 radio is for the MB6CL UHF Gateway. The sound problem on the link has now hopefully sorted, I have replaced the PC with a new one. Any audio reports welcome PLEASE. The antenna is back at 40ft but on a lower power as per my new NOV. I have needed to drop the height of the antenna by 8ft as I found that it was over the height that I first applied for on my NOV for MB7ICL. I would like to thank all that helped with finding the dead keyer on MB7ICL. I visited M3ACU this morning 4/7/09 and I don't think we will be getting any more problems. This morning I found that the PC that MB7ICL runs on had crashed, and it turned out to be the hard drive. I have now fitted a new drive and re installed all the software. If you find any problems, please let me know. I guess the heat in my loft was just too much for it ! Today I put the node antenna back on my tower, so it has gone from 15ft to 40ft. It would be good to get reports of changes to coverage. Every sunday the World Ham Radio News and local RSGB news will be played over the node. It will be at 11am and then again at 6pm. I am adding features to the node all the time. Anything you would like added ? Let me know. I keep being asked about supporting the running of MB7ICL. Here is a PayPal donation button for this.